Girls' summer dresses feature bright, sunny colors and prints in lightweight, breathable fabrics. Whether it's a tea party with her toys or a day with her friends, girls love wearing summer dresses. Girls' dresses for warm weather include tailoring details like cap, short, puff sleeves or sleeveless garments in simple styles. The color palettes range from vivid primary colors to marine-inspired blues, corals and greens. Hem lengths range from above the knee to above the ankle depending on the amount of coverage desired. A dress that has movement works better for younger girls while older girls may like a dress with a little shape. The Levi's denim jumper (pictured at right) would be perfect with a bright colored tank top for a picnic or playdate. It comes in sizes small through extra large for less than $50, and is available in a light chambray denim with a floral skirt, a stonewashed denim with a blue and white floral skirt as well as a solid dark denim. Halter dresses tie at the back of the neck and are typically backless although some have a crossed back or T-strap back. These dresses are a perfect the hot days of summer. The halter neck dress from Bonnie Baby (pictured at right) is adorable and features a vibrant daisy print in white, yellow and black. It is offered in toddler sizes 2 through 4 and retails for about $20 at Amazon.com. This Speechless Crocheted Tiered Halter Dress at Kohl's is made of a machine-washable rayon/polyester blend. It has a crocheted bodice and a three-tier skirt. It is offered in sizes 7 through 16 and sells for about $35. Sundresses are the ultimate summer dress for girls. They come in various lengths and styles such as these two fun and flattering options. This cotton sundress from Amazon (pictured right) comes in a Hawaiian lei print on your choice of light blue, white or black, and the length hits right around the knee. The sizes range 6X through 14, and the price runs just over $20. 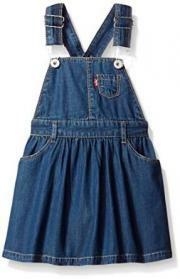 The smocked sundress is a classic style. 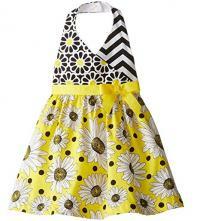 Target offers this Art Class Hibiscus/White Sand smocked sundress in sizes XS through XL. The fabric is washable rayon, and the dress costs less than $15. A-line dresses get their name from their shape. They closely resemble a sheath dress, but the waist of an A-line is slightly tapered. This short sleeved A-line offers the comfort of cotton in a sailor style. It comes in navy or yellow in sizes S (2) through XL (8). This dress has a cotton knit bodice with a woven cotton skirt and is less than $40. This sleeveless A-line from My Michelle (pictured right) is offered in solid royal blue polyester and comes with a jeweled necklace. It's machine washable and comes in sizes 7 through 16 for under $15. Sheath dresses for girls are straight with a loose and shapeless waist resembling a long shirt. This style is a favorite of younger girls because it is not binding as they play. This sleeveless sheath from J. Crew comes in seaport blue or white, and the Morrocan-inspired beading makes this the perfect fashion for a summer party or special occasion. It is available in sizes 4 through 7 and is made of cotton cady fabric which requires dry cleaning. The dress sells for about $230. This babydoll dress in cream colored crinkled cotton with a lace neckline has a pretty, antique look. It hits just above the knee. This style is perfect for summer events like family reunions as it's slightly formal looking but still very comfortable. It comes in sizes 2T through 6 and is less than $50. An empire waist is a classic style of dress for all ages. The waistline of the garment hits between the natural waist and chest. 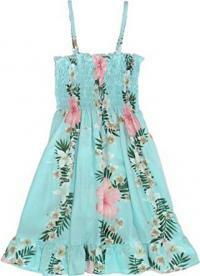 This empire waist sundress is perfect for a summer wedding. It has a multi-tiered skirt with a ruffled hem that hits at the knee in a navy and white polka dot print. The dress is sleeveless with ruffled straps and is lined inside. It is offered in sizes 2T through 7 for under $70. 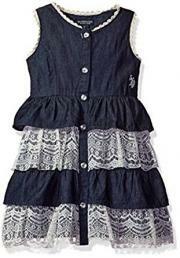 This denim tank dress from U.S. Polo Association has an empire waist and ruffled tiers and is available in dark wash or light denim. It comes in sizes 2T through 6X and is machine washable. It costs under $20. Summer dresses can be worn for almost any occasion. For instance, tea parties with best friends and teddy bears or family gatherings are the perfect excuse for wearing playful girls' party dresses. Choose the style and fabric to suit the occasion whether for Fourth of July picnics or social luncheons. For special occasions, pair summer dresses with lightweight, lacy cuffed ankle socks. For more casual occasions skip the socks, leave the little legs bare and add a pop of color with cute sandals or canvas shoes. While most summer dresses are cute worn as is, they also make versatile layering pieces. Pop one over a colored or white shirt for a pretty summer look. Pair them with matching leggings or shorts for modesty. 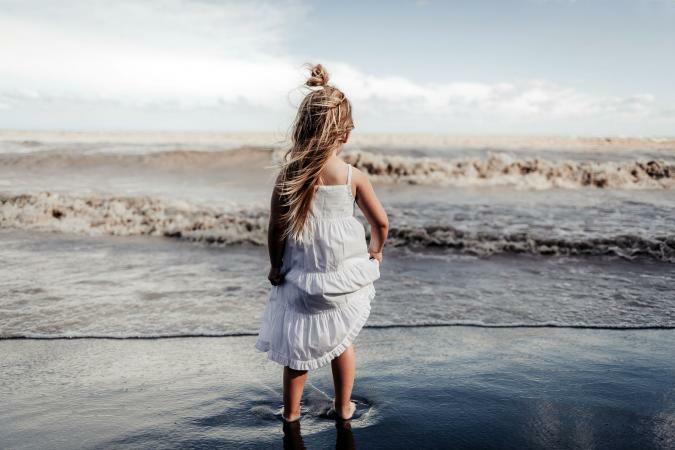 Crisp, white bloomers are adorable underneath little girls' summer dresses for an added touch of modesty. If the temperatures turn unexpectedly cool, protect little shoulders with a crocheted shrug or lacy cardigan. Adding layering pieces such as these will allow those favorite dresses to be worn through the cooler weather of autumn. Kids grow fast, so last year's summer dresses may be ready for the donation box or to be taken to the local consignment store for resale. The good news is, the thrift and secondhand stores usually have a wide variety of styles and sizes in summer clothing that other children have outgrown. These outfits are often worn only a few times and are in like new condition. You may want to shop these sources first to pick up some bargains before you make any new purchases for your daughter's wardrobe of summer dresses.